Damage to Umayyad Mosque in the Old City of Aleppo. Source: Aleppo Archaeology. The DGAM have released photos of damage to Al-Awqaf Directorate and Bab al-Nairab here. They released a number of photos inside the Aleppo Citadel here and here. The DGAM shared photos of the damage to Al-Haddadin Mosque here, as well as the damage to Bab Al-Maqam and Al-Tawashi Mosque here. Aleppo Archaeology released pictures of damage to Souk Al-Abi in the old city of Aleppo, available here and here. Aleppo Archaeology released pictures of damage to Khan Al-Adlyieh in the old city of Aleppo, available here. Aleppo Archaeology released pictures of damage to the Umayyad Mosque in the old city of Aleppo, available here. Saleh Zakkour also shared a photo here. Aleppo Archaeology released pictures of damage to Madrasa Hallawiya in the old city of Aleppo, available here. On 9 January Medmak shared an article in Reuters about freeing Ja’bour Castle in Raqqa by the US backed Syrian Democratic Forces from the hands of Daesh, available here in Arabic and here in English. A photo with an outline of the castle is included. The ASOR Cultural Heritage Initiative have released 2 new weekly reports. November 1, 2016 – November 15, 2016. • Newly published photographs show damage to several Christian sites in Bartella, Ninawa Governorate (ASOR CHI Incident Report IHI 16-0035 UPDATE). • New video footage and photographs show destruction of multiple Christian sites in Karamlish, Ninawa Governorate (ASOR CHI Incident Report IHI 16-0038). • Satellite imagery confirms ISIL militants demolished a section of the Clock Church in Mosul, Ninawa Governorate (ASOR CHI Incident Report IHI 16-0039). • ISIL militant seized and occupy the Grand Mosque of Shirqat, Salah ad Din Governorate (ASOR CHI Incident Report IHI 16-0040). • ISIL-affiliated Amaq News Agency released a video of recruitment taking place inside a mosque in Tel Afar, Ninawa Governorate (ASOR CHI Incident Report IHI 16-0041). • New video footage and photographs from Batnaya show damage to two churches and the town cemetery (ASOR CHI Incident Report IHI 16-0042). • New video footage and photographs show damage to several Christian sites in Bakhdida, Ninawa Governorate (ASOR CHI Incident Report IHI 16-0043). • Local reports and new satellite imagery show damage to the site of Khorsabad due to militarization (ASOR CHI Incident Report IHI 16-0044). • Satellite imagery shows earthmoving equipment leveled the Ziggurat and damaged the Ishtar Temple at the site of Nimrud, Ninawa Governorate (ASOR CHI Incident Report IHI 16-0045). • The DGAM reports ongoing illegal excavation at Dura Europos, Deir ez-Zor Governorate (ASOR CHI Incident Report SHI 16-0161). • A missile, allegedly fired by opposition forces, damaged a mosque in the city of Aleppo (ASOR CHI Incident Report SHI 16-0162). • An alleged Russian airstrike damaged a mosque in Darat Izza, Aleppo Governorate (ASOR CHI Incident Report SHI 16-0163). • A mortar shell damaged the Maronite Diocese Office in Damascus (ASOR CHI Incident Report SHI 16-0164). • An alleged SARG airstrike damaged a mosque in Tarmala, Idlib Governorate (ASOR CHI Incident Report SHI 16-0165). • Alleged SARG forces dropped barrel bombs on a mosque in Kafr Zaita, Hama Governorate (ASOR CHI Incident Report SHI 16-0166). • An airstrike, allegedly conducted by SARG or SARG-allied forces, damaged a mosque in Khan al-Sheih, Rif Dimashq Governorate (ASOR CHI Incident Report SHI 16-0167). • A Russian airstrike allegedly damaged a mosque in Mashmashan, Idlib Governorate (ASOR CHI Incident Report SHI 16-0168). • Newly published video footage shows evidence of militarization and intentional destruction at Mar Gewargis Church in Bartella, Ninawa Governorate (ASOR CHI Incident Report IHI 16-0035 UPDATE). • New video footage and photographic evidence show tunneling at Mart Barbara Church in Karamlish, Ninawa Governorate (ASOR CHI Incident Report IHI 16-0038 UPDATE). • New video and photographs shows additional evidence of intentional destruction to religious sites in Bakhdida, Ninawa Governorate (ASOR CHI Incident Report IHI 16-0043 UPDATE). • New video footage and photographs show damage to sites in Bashiqa and Bahzani, Ninawa Governorate (ASOR CHI Incident Report IHI 16-0046). • New video footage and photographs have been published of Mar Behnam Monastery following the recapturing of the area by Iraqi forces in Mosul, Ninawa Governorate (ASOR CHI Incident Report IHI 16-0047). • An airstrike damaged a mosque in Tayyibat al-Imam, Hama Governorate (ASOR CHI Incident Report SHI 16-0169). • Alleged SARG airstrikes damaged two mosques near Damascus, Damascus Governorate (ASOR CHI Incident Report SHI 16-0170). • Alleged SARG and Russian airstrikes damaged four mosques in Aleppo, Aleppo Governorate (ASOR CHI Incident Report SHI 16-0171). • An alleged Russian airstrike severely damaged a mosque in Anadan, Aleppo Governorate (ASOR CHI Incident Report SHI 16-0172). • An alleged SARG airstrike damaged a mosque in Binnish, Idlib Governorate (ASOR CHI Incident Report SHI 16-0173). • New photographs show evidence of ongoing looting at Palmyra, Homs Governorate (ASOR CHI Incident Report SHI 16-0174). Work has begun in Aleppo removing the rubble and debris from around two of Aleppo’s most famous landmarks, the citadel and the Umayyad Mosque. Teams are now in place to begin assessing the damage so work can be prioritised in at-risk areas. 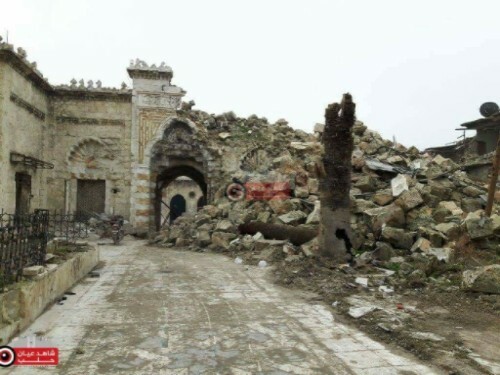 The Aga Khan Foundation, which was involved in the restoration of Aleppo’s citadel in 2008, is also participating in emergency discussions in Damascus and representatives of UNESCO are due to visit Syria next week to agree on emergency measures. Read more here. The On 13 January, the DGAM attended the colloquium “Initiatives to strengthen international capacities for the protection of cultural property and the prevention of illicit trafficking in cultural goods”. to discuss building synergies, co-ordinating international co-operation and improving the international framework for the protection of cultural property. And prevention of illicit excavation trafficking in cultural goods . Read more on the DGAMs webpage here. The most famous hotel in Aleppo is now a centre for refugees. See more (in Arabic), here. In response to scholarly concerns of heritage destruction and looting throughout Iraq, Libya, Syria, and Yemen, the Association for Research into Crimes against Art will be offering its Minerva Scholarships again in 2017 for a select number of candidates from these conflict countries for its ninth annual postgraduate certificate program in the study of art crime and cultural heritage protection. Postgraduate candidates with a background or current position within either museums, cultural heritage institutions or universities from these countries are strongly encouraged to apply. The Minerva scholarship is set aside to equip scholars with the knowledge and tools needed to build the capacity of their home institutions and to advance education about the effects of art related crimes for future generations. Scholarships are limited and awarded through an open, merit-based competition. Awardees of the Minerva are granted a full tuition waiver to ARCA’s summer-long, intensive professional development postgraduate program in Amelia, Italy for the Summer of 2017. For more details about this scholarship for the multidisciplinary program as well and to request a prospectus and Minerva scholarship application materials please see the two links attached here and here. The new Call for Applications for studies starting from the Academic Year 2017-2018 is now available. It covers tuition fee exemption; a monthly stipend; accommodation; medical insurance for degree programmes, masters programmes and doctoral programmes, as well as language preparatory courses and other specialist courses. Details of the work by the Bosra al Sham project, which involves local organisations, civilians and FSA soldiers: it is aimed at restoring town’s historic landmarks. Read more here. The Prince Claus Fund has awarded financial support to the ‘Focus Raqqa project’, initiated by Dr. Olivier Nieuwenhuyse and the Syrian Directorate General of Antiquities and Museums (DGAM). This project aims at digitally reconstructing the inventory of the looted Museum in Raqqa, Syria, with the (analogue) information that is scattered among a number of research institutes in Europe. The project will begin in spring 2017. EAMENA’s Neil Brodie and Lebanese NGO Biladi are to offer a training course on international law and law enforcement as regards the theft and illegal trade of cultural objects. The primary aim of the course is to improve understanding among Lebanese and Syrian culture heritage professionals about the evidential and procedural requirements of European and North American law enforcement when dealing with cases of trafficked cultural objects. The secondary aim is to improve national and international communication and cooperation in this area. The intended outcome is to improve rates of detection, recovery and return of stolen and illegally exported cultural objects, thereby deterring further theft and illegal excavation. Syrian participants will be drawn from the DGAM in Syria and from universities in Europe. The course will extend over two one-week sessions in Beirut, from 20-25 January and 17-22 February. Presentations and interactive sessions will be provided by visiting international experts in cultural heritage law and law enforcement. Shirin reports on work with UNOSAT, updates on the construction of a Syrian Historic Environment Record, and their attempts to assist Syrian colleagues and students with placements, in addition to their future planned work. Read more on their website here. prioritize the protection of cultural heritage to guard against sectarian violence and to develop trust with a local community. military must develop operational capabilities to respond to actionable intelligence that indicates a given site is or may become under threat from looters. A response could include ground forces, airstrikes or varied types of military intervention, and a doctrinal standard is needed. A long-term strategy should also involve the training and education of military personnel on the importance of cultural heritage and the impact of looting. Ruin or rebuild – a detailed look at the problems in restoration by Robert Bevan in the Art Newspaper. Counterpunch reports on American efforts to protect heritage under the Obama administration. Art Media Agency on the Trafficking of Cultural Goods. Dr Nigel Pollard is interviewed about the damage to Syria’s heritage for the BBC here. Concerns rise that the struggle to pay fighters may lead to increased Da’esh looting, according to Newsy. Armies are looting ancient sites in the Middle East, warn academics in the National, here. Copyright © 2017 Heritage for Peace, All rights reserved.